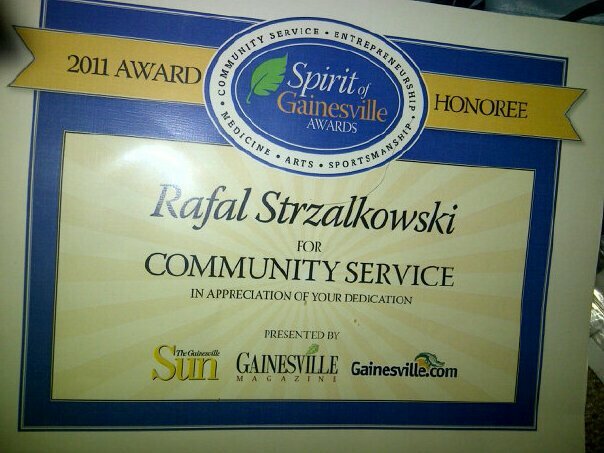 The Gainesville Sun announced their list of the "Spirit of Gainesville" award winners . I was hoping I wouldn't win and I didn't. There's plenty of more accomplished and visible people in this town giving their all to causes they have been involved in for many years. I have only lived in America for seven years. I have been helping the Klausner family for five. I don't even think philanthropy and community work are appropriate fields to have nominees and winners type of contests. In stead of picking who is more or less accomplished I would have focused on highlighting the actual projects they have been involved with. Not by comparing them or having them compete for a prize, but turning the spotlight to the general improvement of the community, not once, not twice a year, but every day. I would've gladly heard more about the work that all of these people are doing and I'm not even sure how they measure against each other and even why would they. Sadly, the local press feels less local and relevant these days. I'm also not seeking personal glory and recognition and I'm sure every one there felt the same. I just want to help kids with disabilities. But then again I've been doing everything I could think of for months to get this cause some recognition. And I know that people respond to personal stories with unnusual twists more than everyday organic work. Congratulations to all the winners and the nominees. I hope to get to know you and network with you and let's do something good together.